"Several thousand Riverside residents, together with guests from other sections of Fort Worth, mixed sand with their bacon and eggs this morning at ground breaking ceremonies for the new Riverside senior high school, estimated to cost $400,000." "A hundred camp fires were lighted soon after sunup and in a few minutes the smell of frying bacon and eggs permeated the 40-acre site on which the school is to be built. Coffee was served from huge urns provided by the Riverside Civic League, which has taken a leading part in assuring the school." 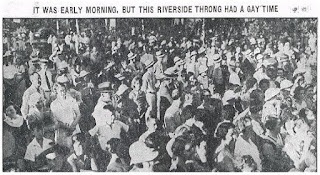 "A hundred or more civic leaders of Riverside and other parts of Fort Worth were introduced and some of them made talks. 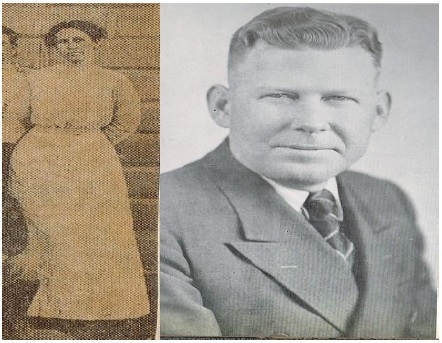 Then Mrs. May Royster, who has taught school in Riverside longer than anyone else…turned the first spade of dirt, while George B.Eagle, school board member from the Riverside section, and Mrs. W.G.Phillips, wife of the civic league president, assisted." "…W.M. 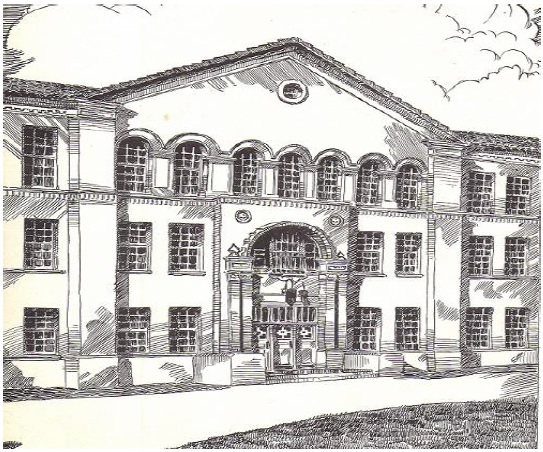 Green, school superintendent…announced [the] first classes would be held in the building in September, 1936…. When [it was] announced that construction would start within 24 hours, the crowd applauded." "Mother Ingraham (Mrs. F. A. Ingraham), first president of the Riverside PTA, [was] presented a bouquet of flowers…. Sam Losh led the crowd in a sing-song…Boy Scouts had charge of a flag-raising ceremony while a bugler blew reveille." What a celebration and show of community spirit! These folks had a lot to celebrate. 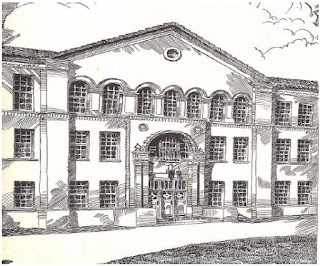 The high school grades at the former Riverside High School had been discontinued in 1922-23 when the Fort Worth ISD took over the Riverside ISD. High school age students in Riverside then had to attend another Fort Worth high school, most choosing Central High (now Paschal) because it was easiest to reach via the city’s streetcars. But for many, the loss of the high school grades in the Riverside community ended their education. Riverside leaders fought for years to get a high school back in Riverside. 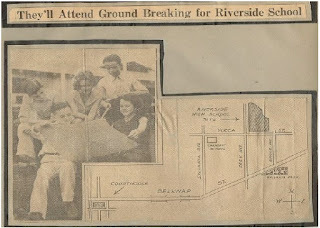 When a school board commissioned study recommended a new junior-senior high school for Riverside in 1933, the community went to work and collected over 1,500 signatures of qualified voters from Riverside, enough to persuade the school board to call a bond election for the erection of new schools. A bond program of $3,000,000 was passed and an additional $4,000,000 was secured from the federal Public Works Administration. 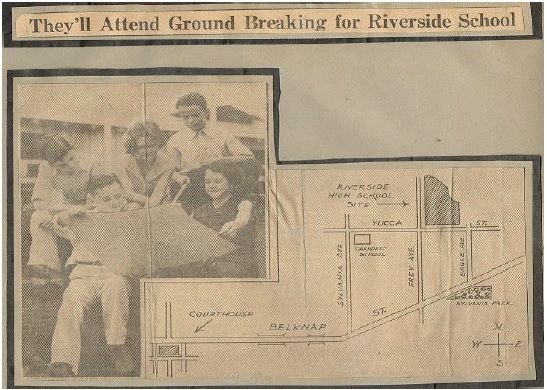 Given the fact that Riverside took the lead in starting the chain of events that led to the building program, and that the new Riverside High School was to be the first high school constructed under the program, Riverside leaders were determined to put on a grand celebration. 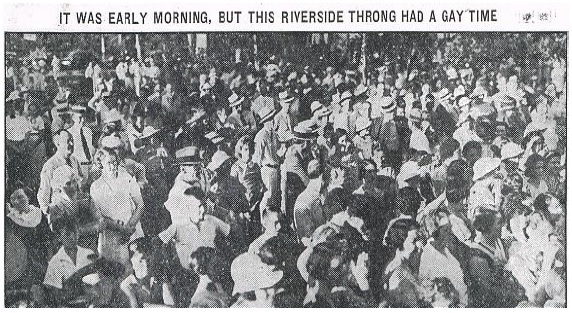 A committee of 190 persons had charge of the plans and the day before the groundbreaking the press reported that "Riverside today will hum with last minute preparations for what promises to be the most gigantic celebration in a section of the city known for its enthusiastic support of civic enterprises". Thanks to these Riverside "pioneers", we have a beautiful building and campus to claim as our alma mater and center of our community. the route to reach the site of the groundbreaking celebration. Mrs. May Royster at Riverside Public School, 1911, and George B. Eagle, Sr., 1937. The silver-plated spade used at the groundbreaking. Some of the revelers at the groundbreaking celebration. Research and text by Rick Herring, copyright 2015. Used with permission.